We’ve talked a lot about pretreatment in previous articles: why it’s important to get your parts clean and what pretreatment options you have. But from a production standpoint, why is pretreatment important? Why add another step to your powder coating process? We’ll examine this using one of the most commonly powder coated materials: steel. If you are powder coating, chances are that at some point you’ll be powder coating steel. Powder is easily applied to steel parts and generally provides a good finish. But what if you need the powder coating on your steel parts to last longer or to be more wear-resistant? You may be providing parts that will be subject to high-impact or are handled regularly, or parts that must last a certain amount of time. Simply applying the powder and curing the part won’t achieve the result you or your customers need. In order to get those results, you’ll need to add a pretreatment step before you apply the powder. One of the most popular and effective forms of pretreatment for steel is iron phosphate. Iron phosphate is a conversion coating that provides a barrier against oxidation. It is most effective on bare (uncoated), clean steel. How Can Iron Phosphate Improve My Powder Coated Finish? Adding an iron phosphate stage to your pretreatment can dramatically improve the quality and longevity of your powder coating. Iron phosphate provides increased adhesion. This is especially useful for slick surfaces. Iron phosphate pretreatment causes a small amount of surface material to be deposited on the parts being treated. This material is slightly textured so the powder can grip it. If the parts are occasionally bumped during their use, this improved adhesion is especially helpful because it keeps the coating intact. Iron phosphate provides increased corrosion resistance. Most powders provide a salt-spray rating of 250 hours on clean metal, but what happens when the protective powder coating is scratched or worn? Phosphate adds a second layer of protection and can extend the salt-spray rating to 500-1500 hours, depending on the process. How Can Iron Phosphate Be Applied? There are a number of different ways to apply iron phosphate to your parts before you apply the powder coating. Hand wipe: While not very efficient or consistent, there are chemicals that can be hand wiped on and then rinsed off to form an iron phosphate layer. Hand spray: Professional quality wand systems, also known as spray wands, are very good at delivering iron phosphate chemicals to the surface of most parts. Iron phosphate works well with heat, so gas fueled or electrically heated sprayers work best. 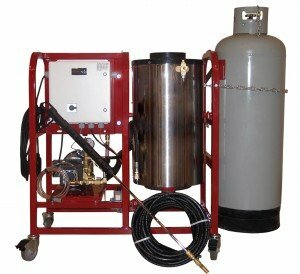 These sprayers may include pressure wash, wet steam or dry steam features. A rinse/seal step is often required as part of the process to prevent streaking or chalking that can interfere with the powder coating. Spraying is often done inside a stainless steel booth, often called a manual wash station, and/or may take place over top of a grated wash stage that allows spent chemistry to be contained and potentially recycled. Dip: Heated chemical vats, also known as dip tanks, are a great way to pretreat baskets of small parts that have hard to reach areas. This often involves multiple stages performed in a series of tanks with rinse stages in between. Automatic spray: This is generally the most effective and consistent way to apply iron phosphate chemistry, but it is also the most expensive. Multi-stage spray systems are typically part of an automated coating line where the parts travel by conveyor at a pre-set rate. A multiple stage pretreatment system can have as few as 2 stages or as many as 8 or more stages. For higher-end architectural finishes, multiple applications of phosphate create an excellent corrosion barrier and other agents in the chemistry clean the part to allow for nearly defect-free parts when powder coating is applied. Where Can I Find An Iron Phosphate Supplier? Search online for companies like Bulk Chemicals, Chemetall, Dubois, or Houghton. These companies and others can provide you with information about local suppliers or will have a local distributor contact you to help you select the proper chemicals. Your local powder supplier can suggest a chemical supplier who will have products that work well with the powders you are using. Thomas Register & related industry guides may also be able to provide you with an iron phosphate supplier. You can get a lot of information from industry guides like Thomasnet.com, but you may have to play around with your search settings to find companies that will do business on a smaller scale. As a general rule, avoid online outlets that cater to the hobbyist and DIY markets. They may have chemical products of inferior quality or from sources that vary from batch to batch. Parts preparation is one of the most important steps in the coating process—don’t risk costly reworks by using cheap, no-name chemistry sold online by the bucket. Have any questions on pretreatment? Need to add pretreatment to your powder coating operation? Reliant provides blast rooms and wash stations for use with your existing equipment, or we can implement your pretreatment requirements into the design of your new coating system. Whatever you need, from hand-wash spray units to fully automated wash stations, Reliant Finishing Systems can provide a quality system at an unbeatable price. Call one of our system specialists today to get started. This entry was posted in News on April 22, 2016 by Bruce Chirrey.